Chris Colfer has already proven himself singing, dancing and acting his way into the hearts of fans worldwide in Fox’s hit TV show “Glee.” On Sunday, Colfer proved himself to be a quadruple threat after world premiering his snappy and ambitious screenwriting debut, “Struck By Lightning,” at the Tribeca Film Festival, to a standing ovation. 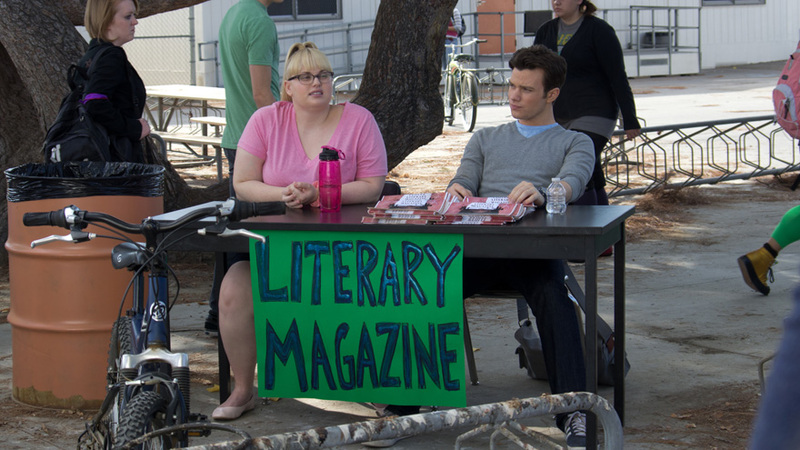 Colfer, who’s 21, started working on the screenplay when he was 16, before “Glee” came along. He began by developing the many characters that make up his coming-of-age tale and in his junior year molded it into a 10-minute piece for a speech and debate event, Original Poetry and Prose, where he played every character. Fast forward five years later and Colfer’s expanded script finds its way to the screen with “Saved” director Brian Dannelly at the helm, and a cast that includes Allison Janney, Christina Hendricks and Dermot Mulroney. 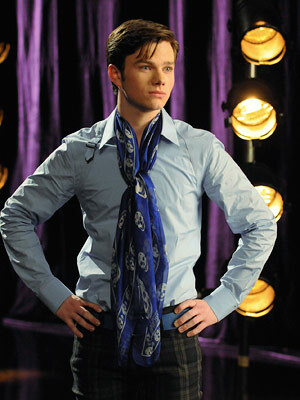 In “Struck By Lightning,” Colfer plays Carson, a senior who will do anything to get into his dream school, Northwestern University, and away from his depressed and alcoholic mother (Janney), who keeps holding him back from realizing his dreams. 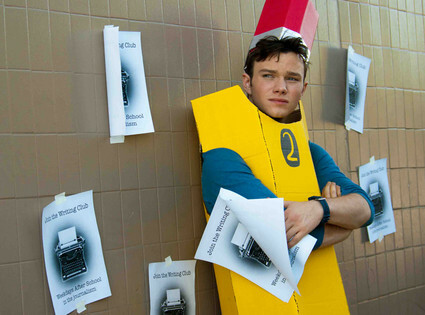 Indiewire caught up with Colfer the day following its world premiere. I feel like I’m interviewing one of the Beatles. I’ve never experienced the “Glee” mania before. No. I hope I never get used to it. I want to know about last night in terms of the nerves you must have been feeling. I don’t think I’ve ever physically been that nervous before in my entire life. Aside from maybe auditioning for “Glee.” The studio network tests, probably. But never before. I felt like I was getting married. I felt like it was my wedding. I saw relatives in the audience, there’s some strangers. Everyone was waiting for me. And yeah, it was crazy. Pretty well, I think. We’ve gotten a really good reception to it. And the fans who were there, who I pretty much made the movie for, seemed to really enjoy it. So that’s all that matters. About the film’s genesis, I know it started back when you were in high school, but I want to know exactly what inspired the initial 10-minute piece. Basically, day-to-day frustrations. It was a screenplay in my head before it was the speech and debate. And I would just come home and I’d vent into the script about my frustrations with my classmates and my teachers and my hometown and high school. And then I found out what OPP was and I was like, “Oh I gotta use this for that,” and I did. And I did horrible in it. I don’t think I even made it to the finals round with it. And then I was on “Glee” and found myself on a platform where I could make the movie and I jumped on it. How did you whittle it down to 10 minutes? Because the script is so expansive. There’s so many characters. I whittled it down to four characters. I was Carson, the mom, the grandmother and the principal. So those were the only four characters that made it. I was still writing the screenplay when I transferred it to there, so it wasn’t like a finished project or anything. But I really just made it a story that focused on Carson’s journey and kind of how he found happiness right before he died. Did the same thing in the movie where it’s flashbacks to people speaking at his funeral and how they really treated him in life. There’s no reason to like him, but you like him for some reason, yeah. Obviously, you share some similarities. Yeah, we look almost identical (laughs). He really is who I wish I was in high school. And there’s tons of traits that are me. I guess the drive, for one. The need and wanting to get out and do something. But I was never brave enough to blackmail anybody in high school. Much. Right, but that’s really the only autobiographical element there is. Are you ready for people just presuming that this is your story and that you’re putting it on film for the world? Yeah, but it’s funny. I should remind people that I’m not dead. So they should know that it is a work of fiction because I am, in fact, still alive. But I’m not really worried about it as much as my parents are worried about it. My mom is scared shitless because she’s afraid people are going to think that’s her. And those are not my parents. My parents are still happily married. And I have a sister. I never had a traumatic divorce that I had to be a part of. But there’s some real-life elements in there. So it seems like you come from a healthy upbringing. For the most part. I have a sister with special needs, so I had a very rough upbringing because it’s really hard to watch your sister go through that and not be able to help her. So I think that’s one of the reasons why I had Carson’s parents go through this horrible divorce because I wanted to show something that made him, the reason why he was so smart. Too big for his britches. The reason why he had to grow up at this young age. What inspired the character of the mother because she’s so clearly defined and the relationship between you two, so beautifully rendered. Honestly, what inspired me the most was this woman that I saw at Legoland once. There was this woman at Legoland who was in a bathrobe, dark sunglasses, was with her kids, did not want to be there and she was really kind of the inspiration for Sheryl. And also just the contrast of him. Carson is a guy that’s stuck in the future, and she’s a woman that’s stuck in the past. And that’s why they clash so much. What was it like seeing an actress like Allison Janney speak your words? Well, Allison was the only actress I ever had in mind to play that role. In fact, when I did it in speech and debate, I kind of imitated Allison. She’s the only actress I’d ever envisioned. And it’s so crazy that we signed her on. She’s an incredible woman and so so talented. It was just an honor to get to work with her. And Polly Bergen. It almost hurts my soul that people my age don’t know what a legend she is. I mean, I could list her resume, but she was the first woman to ever play the president ever in anything. That’s crazy. And a Broadway legend. She’s just an icon. And I’m so glad that she was a part of it. And we got Christina [Hendricks] and Dermot [Mulroney] and won the jackpot. And Rebel [Wilson] was cast the night before we started filming. She deserves it. She deserves everyone to be in love with her. She’s awesome. I interviewed her recently at Sundance and she did this 30-second impromptu rap in the middle of her interview. It was very good. Were you the only one in the room? Yeah, I was the only one there. I asked her to, but she did it. So take me back to the first day on set and what it was like to see it come to fruition? The first thing we filmed was the death scene. When I died. And we went over and filmed the scene where I’m beating the sign. So that was the first day. And I was exhausted because I had literally gotten off a plane the night before from the “Glee” tour. So I had just gotten in from London and I was jetlagged and so tired. So maybe in that breakdown scene, I was really having a breakdown (laughs). But yeah I was tired, but so excited. Physically exhausted, but so mentally alert and ready. Let’s talk about the grueling schedule because the press always makes note of the fact that Ryan Murphy runs you guys to the ground on “Glee,” with all the touring, rehearsing, recording and shooting. When did you find time to write/shoot this? I honestly wrote this script on set on “Glee,” in between scenes, in between lighting setups on set. Which doesn’t seem like a lot of time, but we’re there so much it actually was quite a bit of time to sit down and write. I just wrote it on set. What gave you the drive to get this made with the fact that you’re so busy? It was “Glee,” it really was. It was meeting kids that loved “Glee” and hearing their stories about how they had all these aspirations but no drive and no support. A lot of them didn’t have any support in their life to set them in the right direction. And I really wanted to show the story of a kid who did not have any support. The only support system he had was his grandmother who doesn’t even remember him. But he’s still driven because all he had was drive. I was so sad to hear these stories meeting these kids with all these aspirations, but no belief in themselves. And I thought that was really an important story to tell. Ryan Murphy must no doubt be very supportive of this endeavor. Yeah, he hasn’t seen it yet, but I’m assuming so, yeah. Is there a reason you didn’t include any of the cast [of “Glee”]? People are going to be curious given that it’s a high school-based film. We had just got off the tour! I didn’t want to have any of them do the movie. I was the only crazy schmuck doing a movie between the tour and set. But it was funny because they were all like, “Why didn’t you include…?” or “I would have been in the background.” You were taking a nap, come on! Yeah, I think. Well, I don’t know. I think I’m too young in my career to have those tongue-in-cheek moments like “Oh this is my best friend in real life.” I should keep my roles separate for a while. You’re probably going to get this question a lot, but is there a reason why you didn’t clearly define the sexuality of your character? A big reason, yeah. I feel like the character has a major message, a story to tell. And I was afraid that if we labeled him as gay or if we labeled him as straight, whatever orientation we identified him with, anyone watching with the opposite orientation would not identify with the message. And just in my experience with “Glee,” you have this story about gay kids, the straight kids stop listening. You have a story about straight kids, the gay kids stop listening. You think, “Oh this isn’t about me, I can’t relate to this.” I want to make sure anyone can relate to him. But to sum up Carson’s sexuality, I would say that Carson has a crush on Rachel Maddow and it confuses him. That’s his pin-up girl. That sums up his sexuality.